PCE-EM 882 Multifunction Light Meter Includes sensors for measuring sound, light, temperature and relative humidity. PCE-EM 882 is a portable, handheld, multifunctional digital device capable of measuring four different physical parameters. 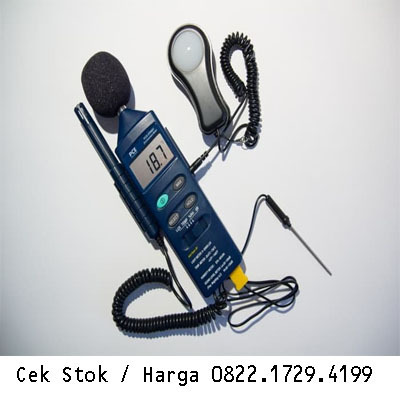 An ideal tool for use in industrial hygiene, HVAC performance assessment and environmental condition monitoring applications, this easy-to-use measuring instrument includes sensors for measuring sound, light, temperature and relative humidity. PCE-EM 882 features max hold, data hold and battery-saving auto power-off functions, as well as over-range and low-battery indication. This 4-in-1 multifunction meter has scores of practical applications for professional and home use, from measuring noise levels in factories, schools, offices, airports and neighborhoods to checking the acoustics of studios, auditoriums and audio-visual installations. The light-sensing silicon diode can be used to measure illuminance in the field, as it is fully cosine corrected for the angular incidence of light. The humidity-measuring semiconductor sensor and temperature-measuring K-type thermocouple allow for complete environmental assessment.